At BusHire.co.nz we like to ensure that all of our customers have a positive experience when working with our company. This is why we work hard to offer an exceptional service at the lowest price possible. We have a range of vehicles including minibuses, mini-coaches and full size coaches which are regularly maintained and have all the latest comforts and gadgets. Our aim is to ensure that everyone who travels with us is fully satisifed and this is why we go the extra mile with our service. How do I arrange my bus charter service? 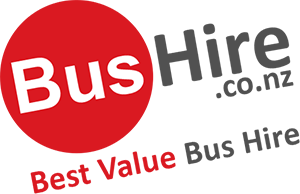 To book bus hire in Queenstown, please obtain a quick and easy quote using our form from above. Please read on for further information on the places that you can visit whilst here. We can also take you from the city to any other destination that you have planned. Groups looking to experience fine wine produced in New Zealand cannot resist the Queenstown Wine Trail Tours. Have your group collected in central Queenstown, taken to various wineries and return safely and promptly. Your group may also wish to visit Queenstown Skyline Gondola and Restaurant for a meal with a fantastic view. Another option is to spend a day exploring the surrounding areas such as beautiful lake side or forests that surrounds the city. Located right at the lake it’s a hub for scenic flights, bungy jumping, jet boating, horse trekking, river rafting and many more options for your group. We also provide transfers to and from Queenstown Airport for groups of any size and our service is availalbe 24 hours per day. Click here to read our guide on Queenstown Airport.